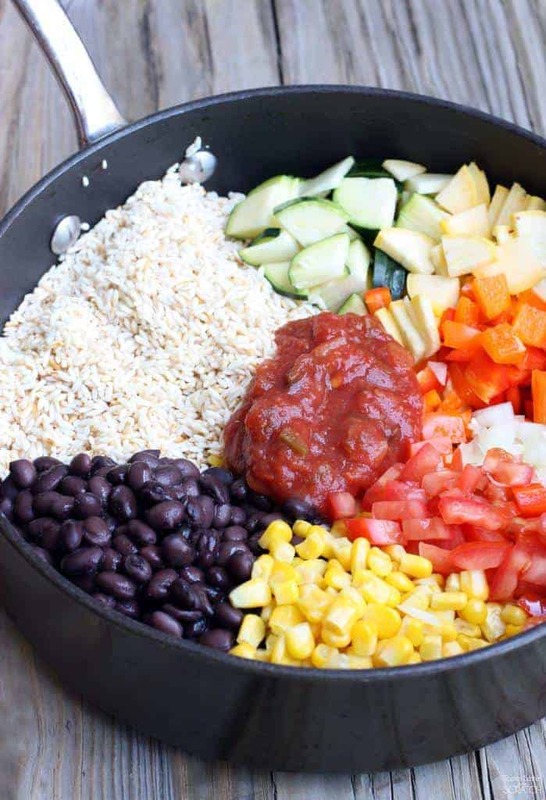 One Pan Veggie Burrito Bowl is rice and black beans with a mixture of vegetables including squash, zucchini, bell peppers, and avocado. If you follow my blog at all, you may have learned that I was able to live in Puebla Mexico for a few months when my husband and I were first married. During our time there we met an awesome chef named Gustavo who invited us into his home to teach us how to make some authentic Mexican dishes! He taught us how to make the most amazing Mole poblano, along with fresh salsas, and homemade Mexican rice. Since then, I’ve probably made his Mexican rice recipe on a weekly basis. It’s the BEST! Well, since I’m totally obsessed with “one pan” meals lately, I decided to adapt my favorite Mexican rice recipe into a One Pan Veggie Burrito Bowl. 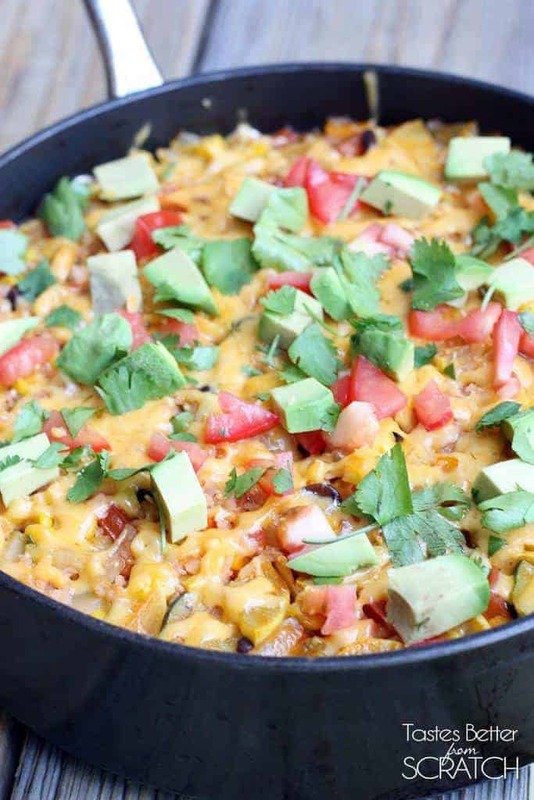 I threw in a bunch of my favorite veggies, topped it with shredded cheese, diced tomatoes, avocado and cilantro. I served mine with shredded lettuce and crushed tortilla strips. My husband likes to eat his plain with a tortilla on the side. 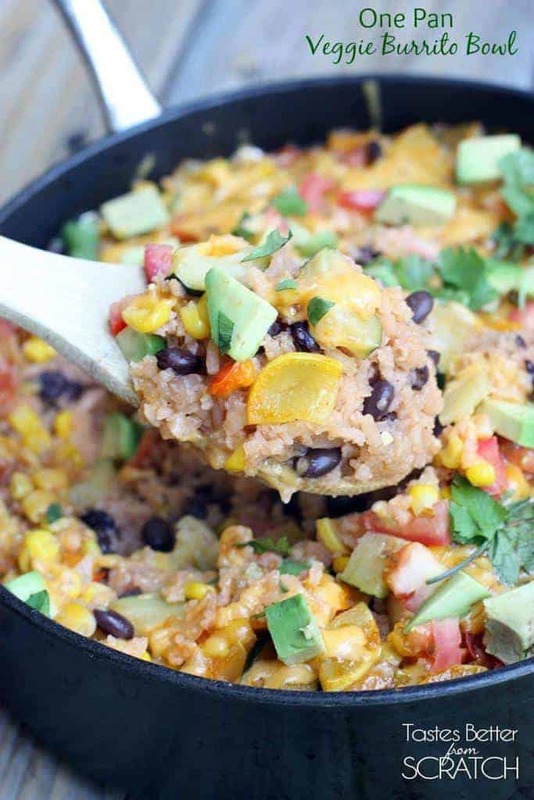 YUM–and perfect for Cinco de Mayo! Use a fine sieve mesh strainer to rinse the rice, and then allow it to drip dry. In a large skillet with at least 2'' sides and fitted with a lid, heat the oil over medium high heat. Add the rice and cook, stirring occasionally, until the rice is golden brown. (This process takes about 10 minutes to get the rice really golden...be sure to keep an eye on it and stir it often enough that it doesn't burn). 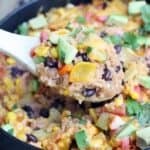 Once the rice is toasted, add the onion, zucchini, squash, bell pepper, black beans, corn, one diced roma tomato, and garlic. Stir well and saute for 1-2 minutes. Chop the tomato bullion cubes into pieces and add to the pan. Add salsa, chicken broth and water and season with a little salt. Bring mixture to boil. Sprinkle cheese, cilantro, remaining diced tomato, and avocado over the top. You can serve it as is, or with tortillas, over lettuce/salad, or over tortilla chips. *Tomato bullion cubes can be found in the Mexican aisle at your grocery store. They're really inexpensive and sometimes the box is in Spanish-- called "Caldo de Tomate"
Hi Dolores, sorry for my error–I’ve updated the recipe! Thanks, and I hope you like it! Is it ok to use quinoa instead of rice? Hi Leigh, I can’t say for sure if the quinoa will cook the same since I haven’t tried it…but I think it could work! I just love your website! Thanks for the recipes. They are always so timely. I was just wondering what to fix for Cinco De Mayo! Thanks Jenny! I aim to please 🙂 I’d love to hear how you like it! I couldn’t love how easy to make and tasty this dish is! Thanks, Lauren! !